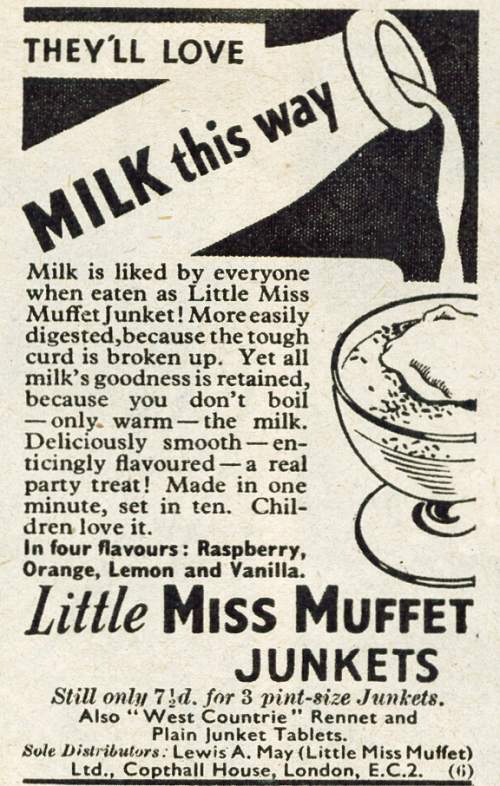 I too loved junket which Mum used to make during the 50s and early 60s. Unfortunately Instant Whip came along which took less messing about as it could be made with cold milk I think. Junket was so refreshing. I would love to get a recipe to make it myself. Any ideas anyone? My mother made us junket a few times in the early 60's, as part of her on-going battle to get my sister and I to consume milk. I recall it came in the form of tablets in a small glass bottle. Miss Muffet is the name I seem to recall. However we were not over enamoured with junket and my mother stuck with Instant Whip which we adored, particularly the short lived, bright green, mint variety. Blancmange served hot, like a flavoured custard was also popular with us. This came in packets of 5 sachets, each of a different flavour (including strawberry and raspberry which always seemed much the same to us). There were also single flavour packs, in either chocolate or caramel. She was still serving us blancmange as a pudding well into the 1980's. I would walk miles for a bowl of the caramel one today. But we never ever once had it cold! However for a special cold pudding she might make up a packet of 'Honeycomb pudding', or even a Royal Chiffon Pudding (lemon, orange and tangerine flavours). I used to watch fascinated as she boiled up the mix, watching the little ball (of flavouring?) go round and round until it fully disolved. When did they stop making them? I worked for an advertising agency called Saward Baker in the late 70s who must have been their agency at one time. There were some adverts for this product, as well as photos of their stand at the Ideal Home Exhibition for various years throughout the 1950s. Incredibly, the pric shown was the same for every year. Unfortunately, the reason I saw them was because I was clearing out the archive room to make space - so everything ended up in a skip. I was only 17 so didn't really think of the importance of it. The little flat bottles of Miss Muffet junket had a label showing Miss Muffet herself. This was always part of the fun, and we loved the delicate colours of the junket when it was made. Have any of these bottles survived ? We all loved Miss Muffet Junket in the 1940s. It was presented in small flat bottles with long necks, and there was a special shelf in a tall green kitchen cupboard for this deightful product. Can I still buy Little Miss Muffet Junket? I loved it as a child. I was born in 1944.